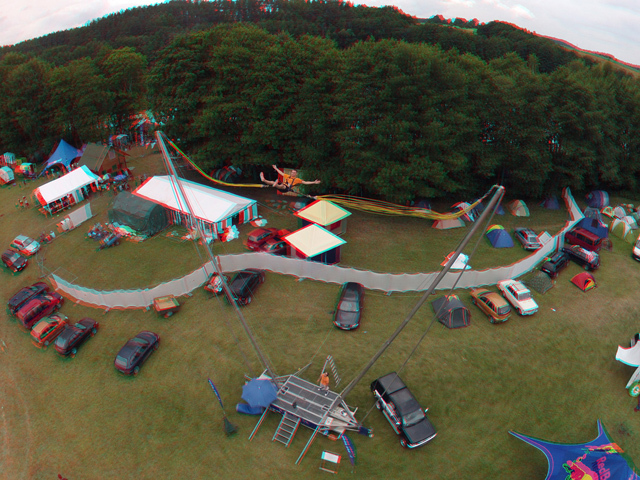 The site is dedicated for stereoscopic video taken by using radio controlled aircrafts. FPV means First_Person_View. The term is usable when a video camera is fixed on a radio controlled model and the operator can see the image in real time. 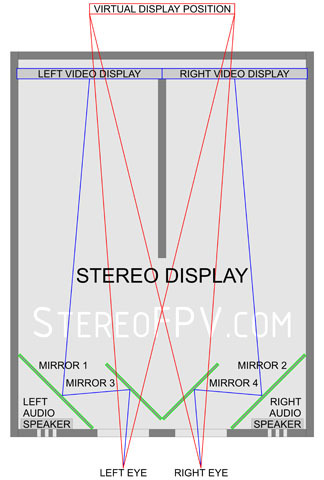 The term "stereo" points out that each eye is provided an individual image. 5. the length of the distance will be: 2/sin(120/640*0.5)=1222 m.
Due to precise balancing, such suspension enables shooting in motion in absence of swinging of the cameras. Precise vertical balancing is carried out using special loads fixed with nuts. Precise horizontal balancing is carried out by shifting loads pressed to the base with strong magnets. Currently, unprofessional cameras adopted for combined operation with another camera for obtaining stereo images are not available in trading networks. Because the signal is recorded on different carriers, it is desirable to synchronize controlling the cameras through the external control boards for facilitation of the editing. Using cameras with an optical or digital stabilizer of the image is not desirable, because operation of the stabilizers of the cameras will differ remarkably. Two video cameras should be precisely directed to the same remote point. For adjustment, the maximum zoom (optical and digital) should be selected on the both video cameras; a remote object should be chosen; in course of adjustment, the object should be precisely positioned in the center of the shot of both cameras; then the position of the cameras is fixed, and; the transfocators are brought back to the wide-angle mode. If you plan to shoot close-ups, optical axes should be crossed at a shorter distance. People can easily cross lines of sight, but it's impossible to spread the eyes apart. 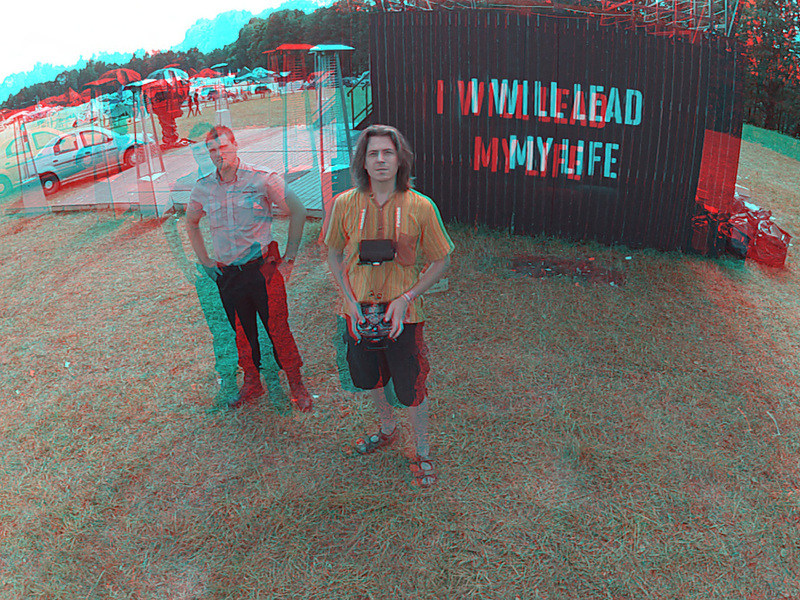 So it makes sense to cross stereo cameras at a shorter distance. Eyes can automatically correct a distorted horizon. When a person is drunk, the image is doubled when the lines of sight cross near the face. Experiments have shown that this distance is around 0.5 meters. A stereo image shows a cat at a distance of 1 m and a naked woman at a distance of 10 m. Some viewers will be looking at the cat and some will be more interested in the woman. If camera orientation remains the same, the eyesight will automatically adjust when switching between the objects. If the operator starts changing the orientation of the cameras, this may conflict with the viewer’s current direction of sight, causing viewing discomfort. If you need to shoot an object from a great distance, you need to widen the stereo base (distance between the lenses) and leave the angle of intersection of optical axes within the 2-6 degrees bracket (1-3 degrees each). If the primary object appears closer to the camera more frequently, you should use a 3-degree angle for each camera. If the main object mostly remains at a distance, you should use a 1-degree angle for each camera. The human eye can irrespectively measure the distance to close objects. For instance, a person can measure the distance to a firefly that is a few meters away while being in complete darkness. If there are several objects at different distances, it makes the measurement more accurate. For example, if a lighthouse is seen from a ship with a bright starry sky on the background, this distance will be easier to measure for a person with good eyesight. In order to intensify the stereoscopic effect in video footage, you need to have several objects at different distances in a single frame. Captions could be used as an artificial reference. How to work with two cameras without a synchronization cable. Manually enable recording on both cameras. Clap loudly before starting. Once finished, import both videos into a single SONY Vegas Movie Studio project. Soundtrack visualization will help synchronize the two files. After synchronization, join both channels into a single one in a stereo mode. Such a display is some large; however, you can place it before you or hang it on your breast. 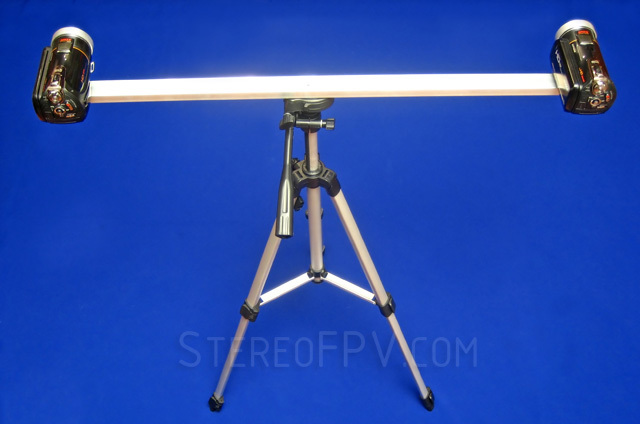 Its advantage is absence of flecks of sunlight, because no external rays access the screen. The other advantage of such a presentation is absence of continuous blinking as in case of using shutter glasses. Stereo image can be made by a home photo printer or at a photo laboratory. 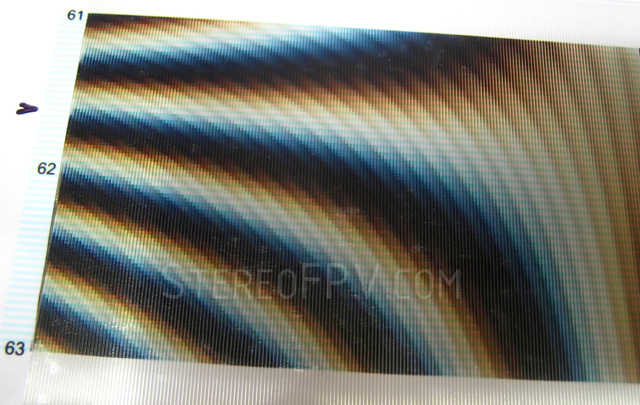 In addition, it is necessary to acquire lenticular lenses with an adhesive layer. 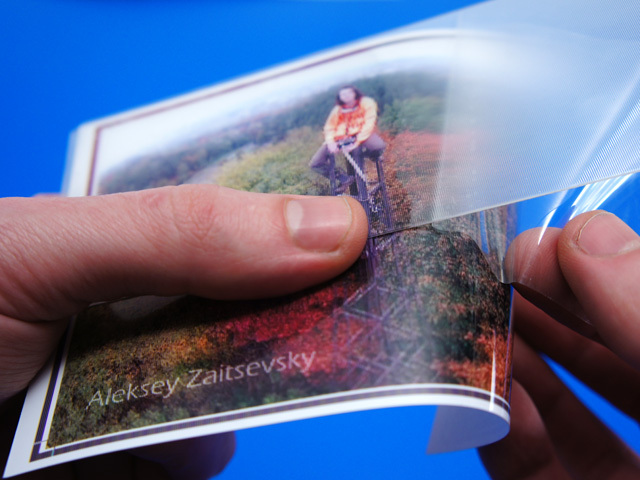 A lenticular lens is a transparent film with microlenses to be glued on a printed image. 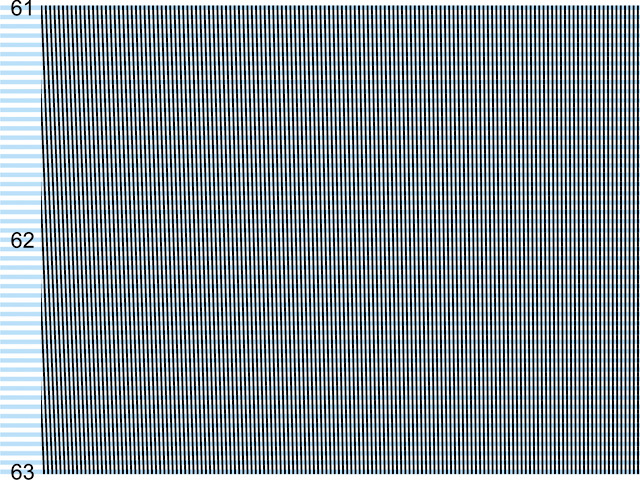 The recommended lineature of a lenticular lens is 62 lpi. You can acquire a special programme for stereo printing; however, an ordinary graphics editor can be sufficient. First of all, a test should be printed (it is a sequence of vertical lines with the period from 1/61 to 1/63 inch. It is necessary for checking conformity of the required lineature with the lenticular lens. If the lineature is chosen correctly, superposition of the lenticular lens causes a homogenous background, without strokes. For two matched images, the resolution DPI should be equal to the double lineature of the lenticular lens, for example, 62.3x2=124.6. Then the image of vertical lines with the required lineature is used as a mask for superposition of two images. The left and the right images are interlaced with vertical strokes under the glued lenses. On gluing lenticular lenses, a great accuracy is required. The aircraft for stereo shooting. Years 2010-2011. 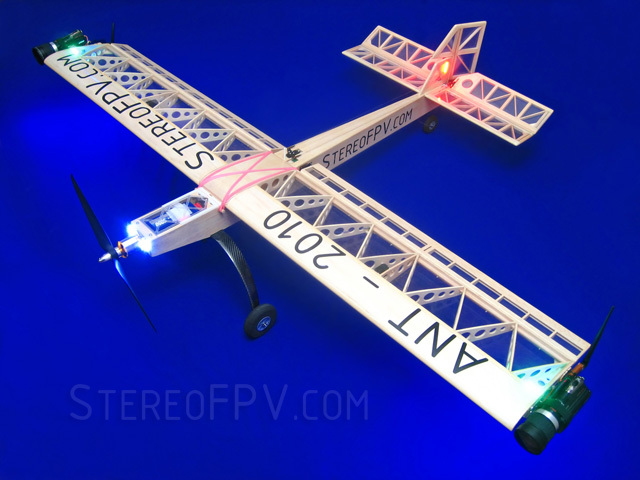 The aircraft was designed and assembled just for stereoscopic shooting. Two high resolution cameras were fixed on consoles of the wing. The wing is one-piece and of increased strength. Arrangement of surfaces conforms to the classical scheme. Control panel Turnigy 9X. It is an uncostly panel of a sufficient quality and convenient for modernization. The first control transmitter FrSky ACCST 2.4Ghz 60mW DIY module. With a directional antenna 14dbi, it ensures a distance of communications up to 4 km. The second control transmitter FM1107 72MHz. It ensures a distance of communications up to 10 km (the maximum distance of communications with possible interference - over 20 km). 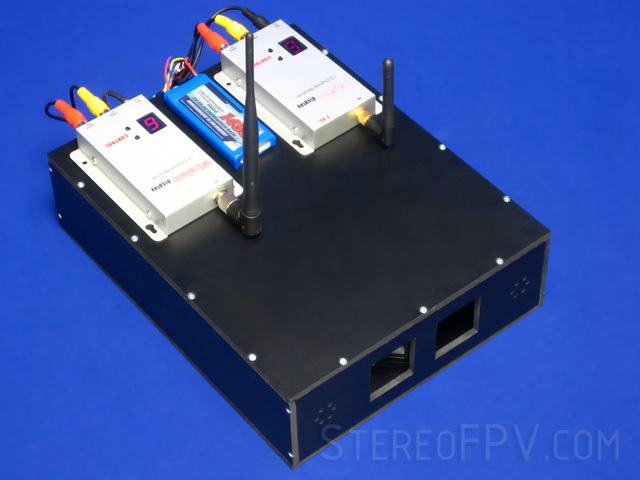 The first control receiver FrSky V8FR. The second receiver Corona RP8D1. The multiplexer of on-board receivers RX-Multiplexer, MyResearch.Lt. The simultaneous control of the model in two frequency ranges ensures high reliability of communications. The receivers are installed in the tail-end of the fuselage. The first channel of video communications: 5.8 Ghz. The distance of communication with a directional antenna 12dbi is 5 km. The second channel of video communications: 1.2 Ghz. The distance of communication with a directional antenna 14dbi is 10 km. Using different transmitters causes different quality of video signals; however, it ensures high reliability of communications. The transmitters are fixed on edges of wings. Video display - 7 inch (no name). The display is used for displaying one of two video signals with an opportunity of switching-over. 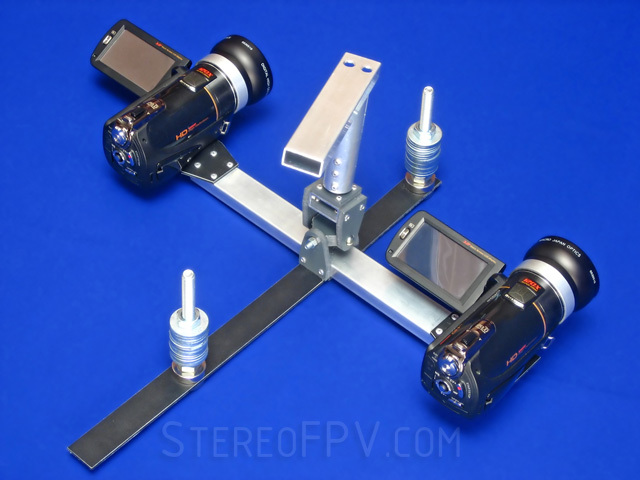 It is sufficient for adjusting the cameras and control of the model during a fly. OSD telemetry EasyOSD. It is used for one video channel. Synchronous control of the video cameras RC-Shutter, MyResearch.Lt. Engine TURNIGY TR 50-65B 350kv. Speed controller Turnigy Brushless ESC 85A, 5A SBEC. The built-in voltage stabilizer is used as backup equipment for on-board devices. The engine's accumulator ZIPPY Flightmax 5000mAh 6S1P 15C, two sets. The principal voltage stabilizer TURNIGY 8-15A UBEC. It is powered from individual accumulator ZIPPY Flightmax 2600mAh 2S2P 30C Lipo. 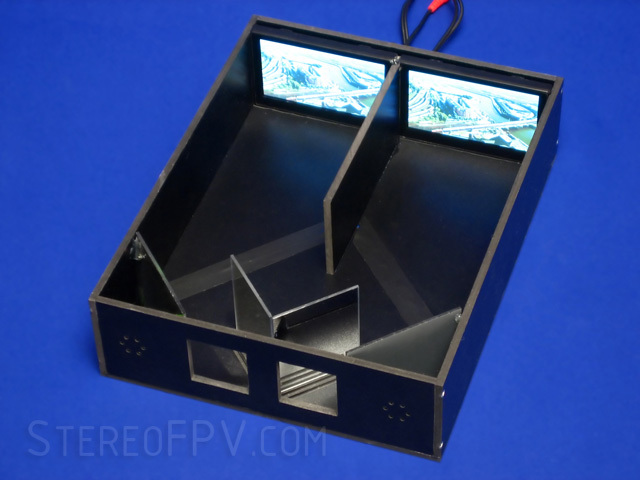 Accumulator for the control panel and the video display Rhino 2620mAh 3S. The materials: balsa, plywood, pine, adhesive, landing gears, covering film, hinges, rods, propeller, conductors, plug-type connectors, LED lamps, radio components and so on. The price of above-listed complete set, excluding the video cameras and taking into account that some home-made electronic parts will be partially used, is about USD1200 (the key suppliers will be hobbyking.com, leiniaohangdui.taobao.com). Delivery of the complete set from China to Lithuania, the customs duties and the customs formalities add about USD 500. All parts of the complete set were acquired in the year 2010. The time consumption: designing of the aircraft - 1 week, choosing the complete set and suppliers - 1 week, production of the aircraft and adjustment of the equipment - 6 weeks. In a majority of cases, ordinary control systems are sufficient for ensuring communication with an aircraft for a distance up to 1 km. For increasing the distance of communication, directional antennas can be used. Transmitters of increased power can be acquired or assembled at home; however, laws restrict their application. Useful information on powerful transmitters is available in fmdiy.com. In any case, a powerful transmitter can be switched on only in desolate areas and on a free frequency. Because the field decrease is proportional to the squared distance, your radiation will not cause any suspect in the distance of some hundreds meters. To ensure safety on long distances of flight, an autopilot, for example, FYETECH FY-21AP or at least the stabilizing system FMA Direct CoPilot should be used. On the aircraft, two modified cameras Speed-120 are fixed. They are uncostly (240 USD each) manual cameras with the resolution of video signal equal to 1920x1080P. The principal imperfections for professional application include unsatisfactory adjustment of white balance and a low bit-rate of signal recording. More expensive cameras were not used because of a high risk of their breaking. 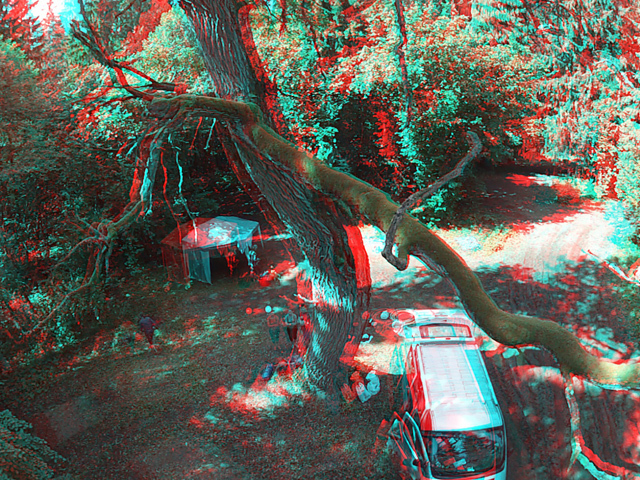 Helicopter with stereo cameras. Years 2011-2012. A T-Rex-700 helicopter was used with a stereo set of two GoPro Hero2 cameras installed above the tail rotor. These cameras are used for filming the helicopter itself. 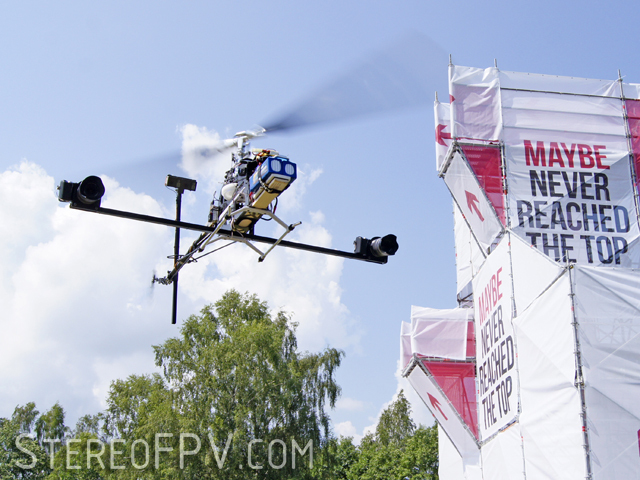 Two Sony NEX-5 cameras were installed on the helicopter body for shooting remote objects. The stereo base for the second pair of cameras is 1 meter. The cameras are rigidly attached, which results in noticeable vibrations in videos. 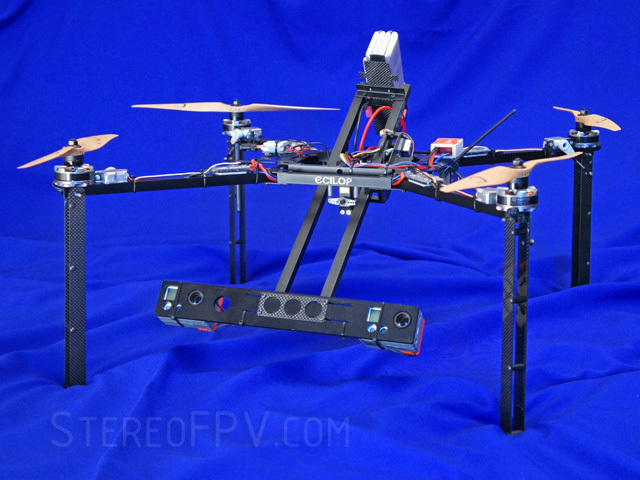 A multicopter for 3D aerial filming. Year 2012. 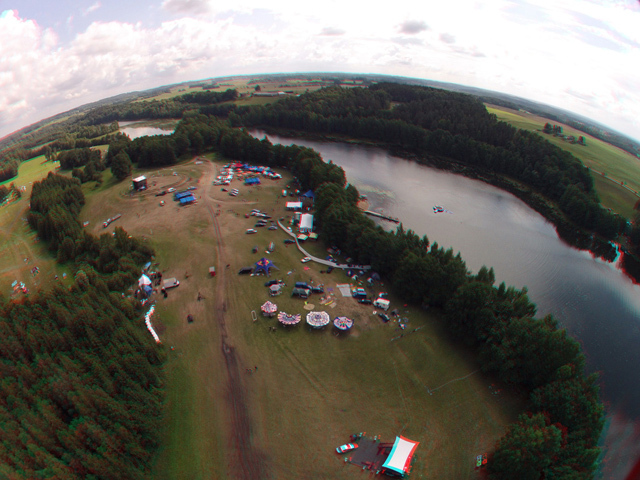 The Ecilop Stereo quadcopter is the first commercial aircraft intended for artistic 3D filming from the air. 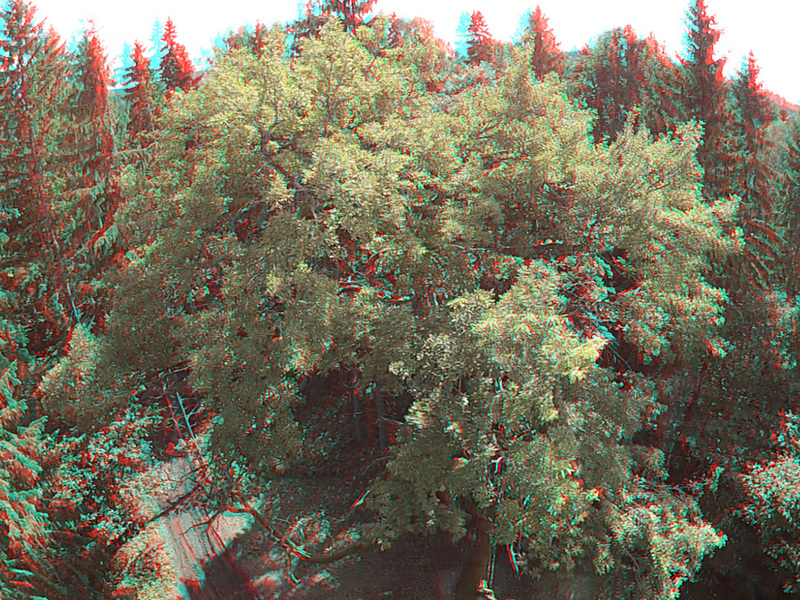 The 3D effect is felt from 3 to 300 meters away.